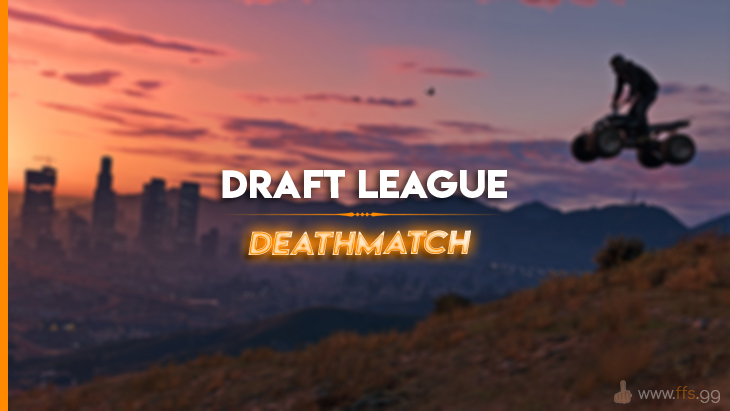 Draft League: Deathmatch is a clan-based tournament that has 20 random DM maps and no hunter fights. Winner is the player who passed more markers than other players. This is same as L7, but using random maps. We already played such tournament with OS maps, check here. How do you pick these random maps? Clan members provide random numbers during the game and maps with these IDs are being set. IDs of maps are being shMADled before each game. How do u make points? Each map has from 4 to 32 markers. Driving through the middle of each marker gives you one point. Therefore, you have to pass as many markers as possible in order to win, safety is more important than speed. So players don't have to be fast? Since maps are random and will most likely be different upon each next clanwar, it's impossible to train out the maplist, but makes you need to learn all the maps out of pool of 300+ maps - or just to drive them safely during the game. However, speed also matters - players who get hunters are free to shoot everybody else driving. So it's pretty much same as Draft but with clans. What are those clanwars with 4 clans? It's DL clanwar but with 4 clans participating in same time. Points for participating in that clanwar are distributed the next way: 3 points for winning, 2 for being second, 1 for third, 0 for last place. *Francis#, Best4Play, Dziugass, windskiii, Reonex, Richardx^, *IceIce, SeNa, Redusz, ZeRoXy!, Robert_M, Subwayx), SeKaToR, ZeldaK, Hamori, Tadeusz^, RemiX*, Lewn, Techo, Zeke#, SmoK!, IsGh, DRFT, Avi, Rilexx, CascaDe, #TheDragoN~, Revolcee}~, CriMenTvz, Mondim, Zeta., +RuSO+, ReigeN, SupeR^, masry, d1Kuba, TRIPL3X, *R!der*, EvVoZ#, Dice*, Eleven, Mixhet, Taigas, KaM!, Kripzor, Leonardo//, F0XY1, *VuuaaK, Vitalic, Jil, WyverN., Abdulaziz al gallad, AkiDrox*, Wade~, ZeRoN!, ^L3id! ¡Come on!, we can win.